If an eggplant could talk, what would you want it to say? 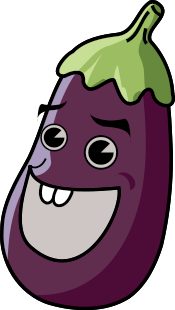 After getting past the creep factor of a talking eggplant, if you’re anything like me, you’d want to know details. Where was it grown? How was it harvested? Is it a GMO eggplant? Was it treated with chemicals that I might find offensive during any part of its journey from seed to table? These are all important bits of information to which consumers should have access, but in most cases, if we’re buying from large supermarkets, we get very few details about our food. Sadly though, we’re often given very little information about the food we eat. If I walk into a local Kroger, for instance, I might see “Washington apples” or “Michigan cherries”. In reality though, that doesn’t tell me much. Michigan and Washington are big states, and just because my fruit came from a place that’s known for its apples or its cherries doesn’t mean that I’m not risking my health when I consume the produce. And remember things like “pink slime” and “meat glue”? We as consumers supposedly didn’t have the right to know about those disgusting practices because they were “processes” and not “ingredients”. Interestingly enough, it seems like California might be trying to get something right. On November’s ballot, California residents will have the chance to vote on Proposition 37, a measure that will require labeling of “genetically engineered” raw and processed foods. As I’m sure you can imagine, the science and biotech folks are all up in arms because the labeling requirement “hates science”, and those on the other side of the debate don’t think that the measure goes far enough. I have to say that I have concerns regarding Proposition 37. While it APPEARS to be a case of well-intentioned folks trying to give consumers more information on which to make purchasing choices, there are exemptions, and it also could have some unintended consequences. For instance, the proposition repeatedly refers to “genetically engineered material”, not “genetically modified organisms”, and not everyone understands the difference. For instance, a hybrid tomato is technically “genetically engineered”; it is NOT GMO. I feel like they’re on the right track though, and I’m not going to grumble about something that’s headed in the right direction. This whole disclosure thing reminds me of what I’ve heard folks say when they’ve worked for fast food chains. “If you knew what went on in that kitchen, you’d never eat there.” Big Food has a lot to hide, so of course they’re going to be reluctant to disclose processes and ingredients that some of us find objectionable. The truth is though, unfortunately, there are still so many people who don’t care about the deets; they just want to eat their Twinkies and Ding Dongs. Now, don’t get me wrong. I like Twinkies and Ding Dongs as much as the next person, but I’m not suffering from some misguided idea that they’re healthy. With whole foods, I assume that they’re healthy, but I can’t make that determination for sure because the industry won’t share the details. Now, as most of you know, I’m a big local food advocate. By eating local, I can go right to where my food is produced, and I can say, “OK, that’s ‘good enough’.” I’m a realist though, and I know that sort of thing isn’t easy or practical for everyone 100% of the time. Give us the information and let us speak with our dollars. If you’re scared to disclose the information that we consumers want to know, then perhaps you ought to look at a different business model. I’m just sayin’. This entry was posted in Uncategorized and tagged consumer rights, food freedom, Proposition 37. Bookmark the permalink.